A nice muddy run for the few Striders that joined 341 runners at Huncote ending the year. This is a friendly approx 10 k covering footpaths, a climb up Croft Hill and a stream crossing. This is my 6th or 7th year doing this event which is now in its 36th year, for those unfamiliar with this handicap challenge it’s an annual Boxing Day event with slower runners starting first with minute intervals with the idea of all runners finishing together. If you haven’t done this one before it’s a great way to get on out there on Boxing Day rather than watching Goldfinger or polishing off the Quality street. Very happy to report this year got the record Stilton Striders turnout with Boxing Day regular David Hall (debuting in his Stilton top), Kaye Mead, Katie Hateley, Sarah Procter and John and Janet Hudson out for team Melton. Although this is now pretty much the same course as the Barrow 6 LRRL race probably 70% are in fancy dress, another 15% are hung over or taking it steady and the rest are semi-taking it serious. Half between little confidence, half between fatigue I set myself an easy target this year of 7:30`s and an easy plod round a course I’ve never been fond of, I thought I’d be amongst old running friends in my group but set out with no-one I knew. The plan was to catch up with Katie who set off a minute earlier and run with her, although I was gently reeling her in and she was running a blinder, its David Hall I catch first on that awful undulating road out towards Hoton.Nice and steady as we hit the flat, I pass Katie who waives me on and next catch up with John Hudson where I slow up and run beside him for a bit, pressing on I find an injured and tearful Sarah Procter who despite running with painful injury still managed a sub 50 min time! My run takes me past various Fairies, Roman centurions, men in drag, Santa`s, jockey`s, Leprechaun`s, Schoolgirls and giant Chickens! Last mile and a half I find Kaye Mead in Super Mario Bros outfit, she`s suffering she reckons, it was hard work but she did it, no doubt! I told her she`d done the worst of it lying through my teeth as that horrid hill back into Barrow loomed. Heavy traffic round the park and then the long straight road back to Humphrey Perkins School and the finish, 41:32 in a course nearer to 10k than six miles and not even out of breath! That certainly bodes well for 2017. So I travelled up the road to have a dirty run in the annual Gaddesby Gallop, I’d like to do more X country but they tend to be on a Saturday which is a bit awkward for me but I was given the green light for this with strict instructions to meet the other half for lunch before half 12. I did the run got home had a shower and was in the pub in town by quarter past 12 where 5 mins later my lunch arrived, perfect. Anyway, the Gallop is a 5.2 mile off road race with a dew pond, a drainage pipe and Stream crossing as well as stiles and gates to contend with. And a christmas hat to wear if you want. A field of 120 gathered in quite decent conditions on the day and I wasn’t sure how my new bright yellow inov 8 would perform in the mud so I took it steadyish to start and as my confidence grew and started to get a feel for it I worked my way through the field catching people all the way round feeling good. I finished in 10th position in 38min 2 secs, other Striders running were Christie Jones one of our new recruits who got round in 51 min 27 in 69th place and just behind was Steve Dewick in 52.10 in 74th. But run of the day must go to another Strider , I didn’t know who he was (or that he was a Stilton Strider) until I saw the results but in 5th place , in 36 min 23 secs was Owen Blair, who is a junior. Amazing run, I spoke to him and his dad briefly after congratulating him on his run, he was only a little lad, very impressive. I really enjoyed it, great event, bring on more mud. On Wednesday evening a small group of Stilton Striders travelled to Leicester for the 2nd round of the Victoria Park 5k winter series. A 2 lap course around Victoria Park some parts darker than others ( pitch black actually ) first back in 4th place overall in a fantastic time of 17min 05 secs was Jason Barton, followed by Darren Glover in 18.56 in 12th ( 3rd veteran), then Clive Kent in 20.13 in 16th, first lady back for the club Vicki Lowe in 23.05 (2nd vet 45 ) in 28th place followed by Liz Goodbourn 24.01 in 32nd ( first vet 50 ) then Theresa Coltman in 24.33 in 35th ( 3rd vet 50 ) and with the ladies winning the team prize the club came away with 6 bottles of wine, oh and a handful each of mince pies. Congratulations to all our winners at the 2016 presentation night! Strider Cup winner- Jenny Kent. Female runner of the year – Natalie Teece. Male veteran of the year – Darren Glover. Club person of the year – Jenny Kent. 4th place SM Jason Barton. Runners up in their division was the Stilton ladies team. We get trophies for the four highest scoring ladies, which this year were Lou Houghton, Natalie Teece, Vicki Lowe and Jenny Kent. Sorry for the late report, but they all count. The annual Wymeswold Waddle road race took place back in May of this year with 268 runners taking on the undulating 5 Mile course. Two things that I can remember of the day, it was extremely warm and Shane decided to run the 12 miles there as a warm up! Well done all, lots of fantastic running and a great night. 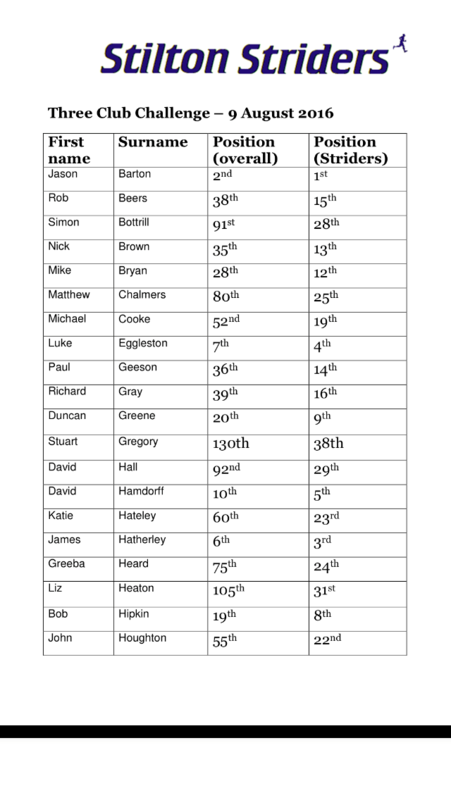 Thanks to Barrow for organising- quite amazing that (after a recount…) the result was a tie between Stilton and Barrow both on 839 points from 25 runners. 14 Striders made it for this year’s Beacon hill trail half marathon running on its 3rd year in a row. The course is two laps and takes you through the beautiful scenery of the Beacon Hill Country Park and includes hills, woods, fantastic views and fast downhill sections and even more hills! Just north of Chesterfield the annual Clowne half Marathon, a very hilly and most often windy and cold half marathon with a ton of crippling hills, sorry not really selling it am I? Still a road half Marathon for just £18 and an absolute superb goodie bag might help get a few up to this next year. Running my first road half marathon in two years and I’m absolutely full of cold, the weather driving up the M1 was enough for myself and fellow Strider John Hudson to keep mentioning warm fire and going home. I did Clowne probably four years ago it was bitterly cold and windy yet somehow I did my first sub 1:40hm, If I got anywhere near that today given how yucky I was feeling (I even packed a base layer and considered longs!). Like many we didn’t leave the warmth of the leisure centre until the last minute to head to the start it was cold, very wet and windy all day, In the end I plump for shorts and vest, be quite rude not to. Getting underway I don’t feel too bad, although early progress is hampered by my shoelaces coming undone twice in the first two miles and playing catch up. My mile four I`m not feeling too bad and passing people throughout, the hills don’t worry me too much and I’m quite surprised when I clock mile five at 6:21. From 10k on I`m running with a guy from Matlock and one from Grantham a.c, pretty much egging each other on silently and we all seem to be making progress passing people as we go past 2nd lady at mile 9. Most of the course is nice rural lanes, there is one village you go through which utterly says `old mining town`, about mile 9 there is more pavement which isn’t great especially one section which is on a right camber. There’s` a very unwelcome hill at mile 10 up to the church, I recall having done this previously a marshal saying “It’s all downhill from here” , it certainly is not, the fibber! Legs start to welt at mile 11, although I continue to pass people up to the last mile and never get passed myself, hopefully that means I`m doing something right. Last hill into Clowne feels like a 15min mile and the last 400m feels never-ending, cross the line way ahead of what I’d have been happy with. So the wet, cold, windy and hilly course may not appeal but under £20.00 for a road half including not just Banana, flapjack and water after but probably the best goodie bag I’ve ever seen at a road race! Hoodie, Tech T-shirt amongst a bag full of things. Overshadowed by Seagrave but a day with far better weather our small but happy band of Stilton’s headed to race 2 of the Derby XC league at Markfield. So having done near 17 miles of Seagrave challenge the day before the quads weren’t great, luckily for me I was joined by a great team of XC newbie Matt Gayton, the Stilton debut of Mark Ashmore (and his Junior runners! 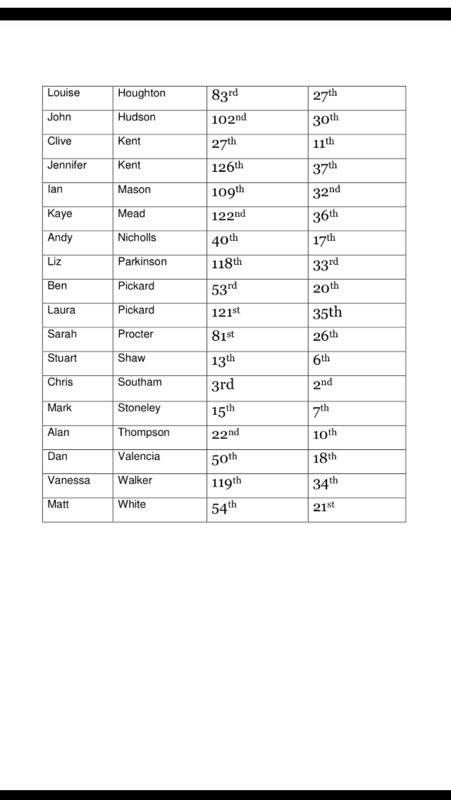 ), in form Natalie Teece and Striders legend Nick Brown. Matt asked a pretty good question before hand “These are the same people who run the league runs?” yes totally, same people from the same clubs no Dathan Rietznhein clones, same people as you beat in the league runs! Today is one of the races where they split Male and female runners by 10 min staggered start, I’ll be honest the worst bit in these races are the starts when 400+ plus blokes go all out sprint for the first corner. I`m pretty much taking my time and enjoying it, not far in I’m forced to anyway as my laces somehow come undone three separate times! Once the pack starts to thin out they do get a lot more friendlier and enjoyable. Because this series is now so popular or even oversubscribed, very much like a fell race your stuck often in lines and have to take your passing chances when you can get them, let’s be honest they are all a good bit of fun so don’t no use getting upset over your garmin time. This is my first race in spikes and very happy given its now getting quite muddy underfoot, the others grumbled about the uphill’s but today I felt I did some of my best work on the ups and downs. So with the lace problems of earlier most of the race for me was a negative split and playing catch up which actually made it very enjoyable.